I LOVE this song. If you watch the show Empire then you heard this song. It is from Actor/Singer-songwriter Jussie Smollett who currently plays Jamal Lyon on the show. The song is written by Jussie it has a smooth vibe once you hear it you will definitely keep it on repeat. Sharika has been doing hair for over 15 years I specialize in healthy hair under protective weave styles and much more. Salon Vanity has a full staff of 5 other great stylist and Augustas hottest Make-Up artist. Salon vanity is Augusta's premier salon so if you ever in Augusta,GA go and get vamped by Sharika or the vamp squad at salon vanity. This Song this song should have been a single the vocalist on this song is name is Chinky she was from Sisqo's group called LovHer. They went IN on this song. The vocal the lyrics were so on point. This song is off of 112's album part 3. It was produced by R. Kelly and if the you can't recognize the voice it's from Micheal Keith ( I love his voice) he has strong vocals but it's lead on a lot of songs. This song has so much emotion just like the previous. This could still be a single but it's still on my list. I love this song. It's all about taking care of the issues at hand. T.I. raps about his past issues over this soulful beat. Victoria Monet's vocals will have you mesmerized. Worthy Hair Spotlight is Hairstylist Shawanna and owner of Shair Elegance Hair Salon. She has been doing hair since the age of 13. She has had her license for 6 years. She specializes in cuts, weaves, short cuts and wedding events. Her salon Shair Elegance is located in Brooklyn NY where she will be having an event on Feb 22 from 4-8 called "Launch Your Beauty"
So a few weeks ago I was really confused I was confused and drawn between Worthy Worth It & Priceless and Tammy Simmons Designs. I was thinking of where I was supposed to be and what I was supposed to do I was praying to God asking God for a dream or something some sort of sign for help. I went to church and before I left I asked for prayer and I during this time I was supposed to be moving and everything just halted because of the move when I was prayed over and God said for me to take myself out of the equation and put him in it. Now mind you I had a dream before where I could hear my grandmother saying to me you can do all things through Christ who strengthens you. 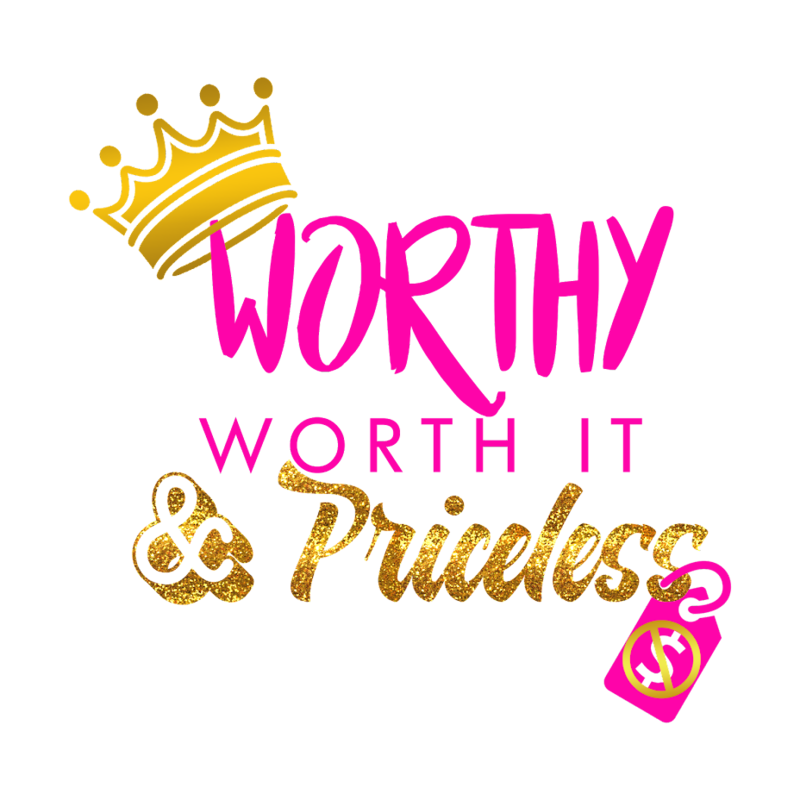 Even with that I somewhat still didn't get it I figured that I was supposed to go forward with Worthy Worth it & Priceless but I wasn't sure and now to sidetrack (I have other ideas and plans what were they Worthy Worth it & Priceless more than just the blog. ) so with that being said, you fast forward to this Sunday and the sermon for the day was Stop Smelling Yourself and the Pastor said a line that was just like what was prayed over me. You have to do what you're supposed to do. NOT withyou and mine but with God in my in mind. The task and the plans I had for the Worthy Worth It &Priceless was too big for me or to the point that I didn't believe in myself enough to actually do. It was basically all about me. Then I started to see things that I wasn't happy with (not blog wise but world wise) I was unhappy with how women are portrayed how even we are portraying.I can't sit back and not do anything or just remain silent as before. I realize that this blog is not about me. It's to help other people realize their worth and their value.I can't reveal my plans right now but very shortly and by the grace of God I will start putting them into motion. I was sent an email by Jep Roadie. With the this song and info posted below. I liked the song and wanted to share with you guys. Click on the music link for get more info. Speaking as the "lone wolf" that they always refer to, I can tell you what comes of seclusion. Plenty of self awareness and the yearning to save. Not in the way most "rappers" use the term nowadays. But in the traditional sense. Actually saving someone's life. Of course, it is just an extension of our overall humanity and willingness to put others before ourselves. Nonetheless, I did not choose to save. I do not like to save. I simply need to save. It cannot be controlled. By day, I can't really stand most human interaction. I find most to be self absorbed and simply lost. Most are lost because of the devices used to distract the world. But by night, I am the one howling at the moon in hopes it will reply. I don't do this for recognition. I do not do this for monetary gain. It would be much easier to rob a bank than to become a superstar. I pretty much do this for a family member, I am yet to meet. I do it so that a lost soul may be revived by one of these recordings. The lone wolf always seems to be lonely. But maybe inside his heart, lives the voices of all. This is no sermon. I am not preaching. This is no attempt at being something I am not. I am writing this in hopes that someone will relate. That someone will understand what I am saying or how I feel. Until then, I will continue to write these songs. Everyone is a Super Hero in someone's eyes. Ideas like that make life worth living. I love you. Sincerely, A 90's baby, who was given PTSD." I am so happy. I can't believe my dream of having a positive place for women to come came true. With Worthy Worth It & Priceless, I have have pushed myself further than I ever thought possible. By the grace of God I have broken past my comfort zone and shyness. I would like to thank every hairstylist, Model, Musician, & Hair Company. That allowed me to feature them. I would also like to that every reader,visitor that came to the site thanks without you there would be no way we could have reached 11k+ views. Also thanks for watching the videos as well. Thanks for everything. No I gotta get back to work. I am almost done moving. Ill be back very soon.